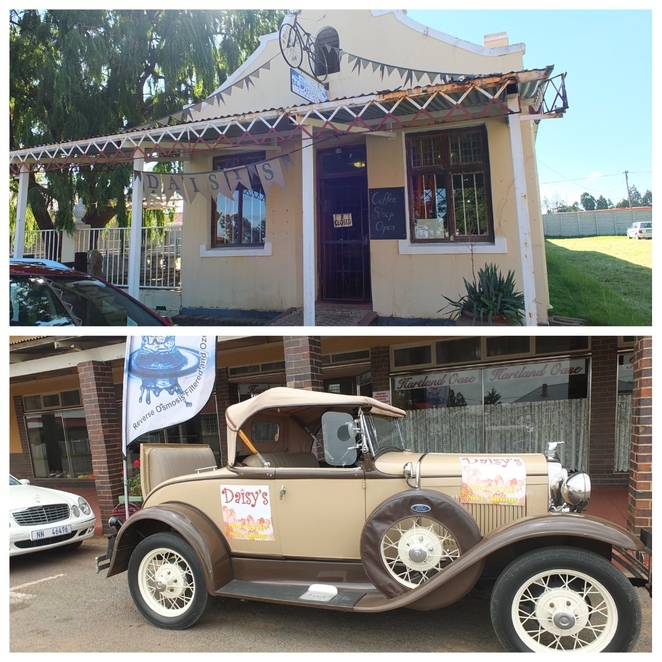 The next stop on our road trip was the Farmhouse Lodge in Newcastle, a city in the province of KwaZulu Natal. This thriving commercial centre was named after Newcastle-upon-Tyne in the United Kingdom and has links with twenty-seven sister Newcastle towns scattered throughout the Western world. 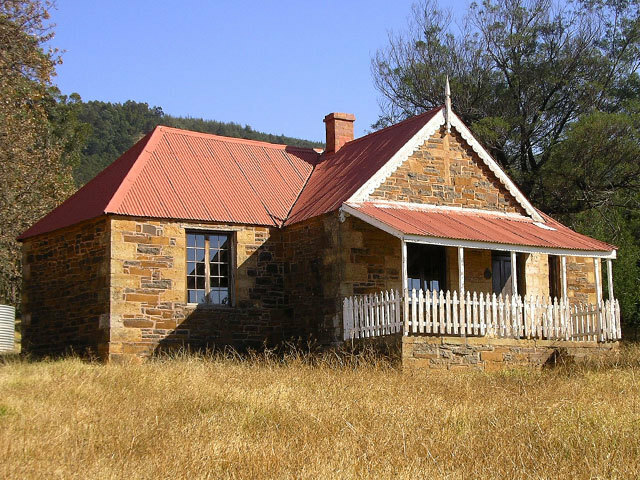 Located on the alternative route linking Gauteng and Durban between the KwaZulu-Natal Battlefield Route towns of Volksrust and Ladysmith, Newcastle visitors can visit the sites of some of the major battles fought during the First War of Independence, including The Battle of Majuba. O'Neil's cottage, where the peace treaty was signed, signalling the end of hostilities can be found outside the town on the road to Volksrust. Travellers to the area can visit the Majuba Commemorative Farm (unfortunately closed on the weekend that we visited), which forms part of the Battlefields Route of KwaZulu Natal. The purpose of our trip was family-oriented, but this only added to the absolute pleasure we experienced at the panoramic beauty of the undulating Drakensberg Mountain ranges. On route we passed the little town of Memel (which is now called Memel-Zamani) in the Free State province of South Africa. 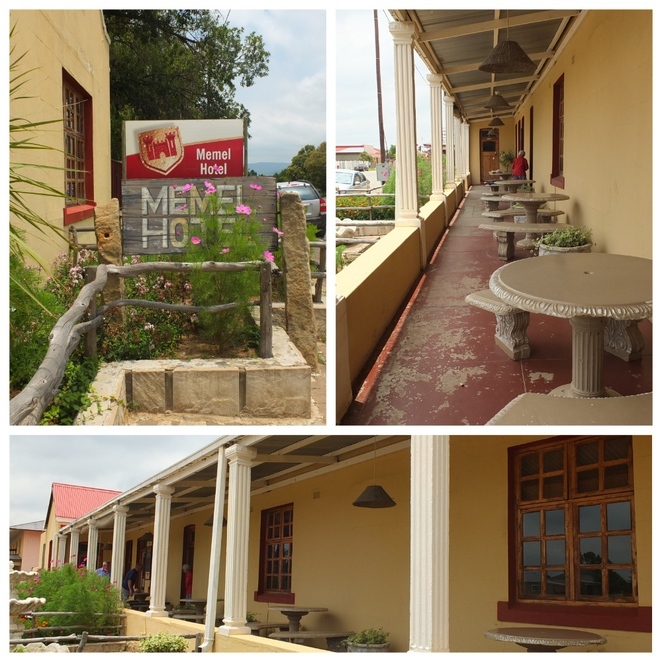 Memel has a very high elevation - 1730 metres above sea level - and its close proximity to the Drakensberg escarpment is one of the main reasons for their winters being bitterly cold. But, what spectacular scenery - lush, green, rolling hills as far as the eye can see. To the north of Memel is an area called Seekoeivlei (direct translation: hippo valley or hippo lake), a wetland covering an area of approximately thirty square kilometres - a bird-watchers' paradise. Seekoeivlei is home to more than two hundred and fifty species of birds with birding habitats including high altitude plateaus, numerous rocky outcrops, hillsides and cliffs. Hippopotami (love that word) were originally found in this wetland many years ago but were apparently sought out by hunters of the day and destroyed. Hippo have now been successfully re-introduced to the area and with bird-hides and walkways it is a great spot to be enjoyed by tourists and keen birders. We popped into the historical 103 year old Memel Hotel for a cup of tea. This quaint little hotel is owned and managed by Chris and Audrey. Chris is a keen motor biking enthusiast and as such enjoys and encourages visits from like-minded adventurous bikers, who flock to the area to enjoy more than 600 km of off-road tracks. Onward to our destination - Farmhouse Lodge. 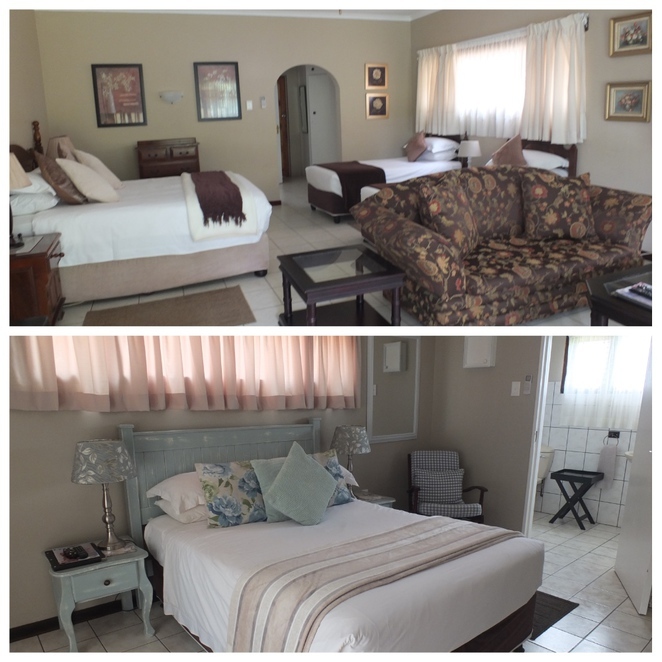 Farmhouse Lodge is a three-star graded Bed and Breakfast located in a peaceful suburb of Hilldrop in Newcastle, KwaZulu Natal, the land of Shaka Zulu. You might have heard of Shaka Zulu? Shaka was the great Zulu king and conqueror, who lived in the area between the Drakensberg and the Indian Ocean. I digress! The Farmhouse Lodge is only three minutes from the centre of Newcastle and is surrounded by the northern Drakenberg Mountain Range. It is a Bed and Breakfast that accommodates corporate guests as well as leisure-seeking tourists and a great stepping stone to this history-enriched environment. Every room has direct access to the gardens around the Bed & Breakfast and private patios reflecting the country charm of the surrounds. For room rates, please click here. I've included the Currency Converter here. For booking enquiries, please click here. Why would one choose to visit this area as it is not specifically known as a tourist destination? ✔️ To enjoy quaint rural towns in the back of beyond. 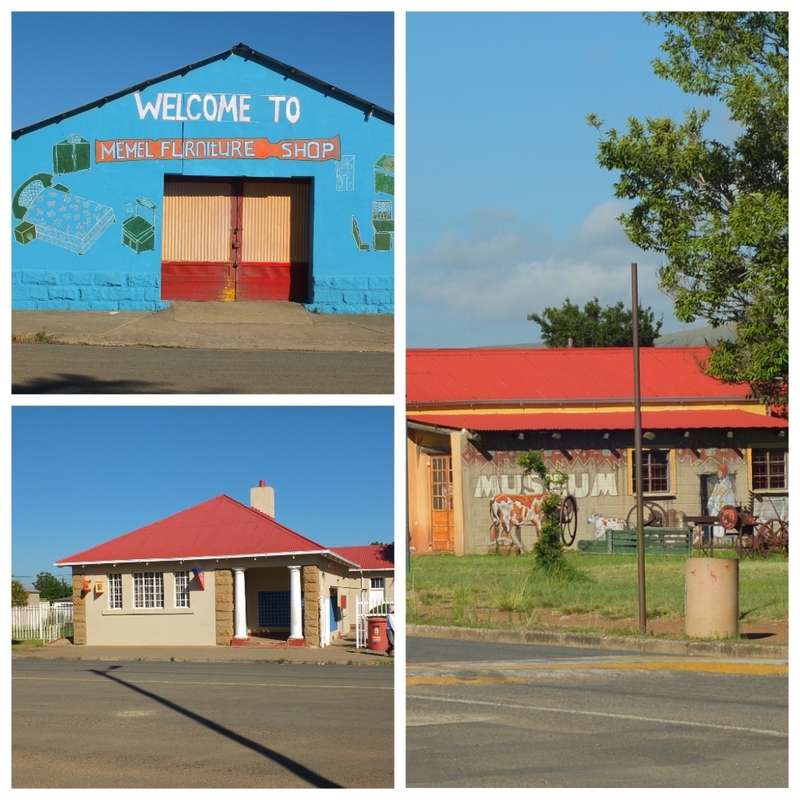 Whilst driving through this region, one regularly comes upon little stalls called "PadStal" (translation Road Stall) - picturesque little houses where one can buy the ever-famous biltong and dry wors (sausage) and unique South African gifts. A definite must-do if you're looking for home-made souvenirs or African homewares to adorn your home. It may sound like a lengthy trip, but even though we drove through three provinces (states) of South Africa — Gauteng, Free State and Kwa-Zulu Natal — the one-way road trip from Johannesburg was only 328kms. This region is mid-way between Johannesburg and Durban. Considering the distances we cover in Australia, this would surely be a walk-in-the-park. If you're into history, bird-watching or off-road motor biking, with spectacular scenery thrown in as an added bonus, then bookmark Memel and Newcastle for your next travel destinations.